Explanation: As you (safely!) watched the progress of yesterday's partial solar eclipse, you probably also spotted a giant sunspot group. Captured in this sharp telescopic image from October 22nd the complex AR 2192 is beautiful to see, a sprawling solar active region comparable in size to the diameter of Jupiter. 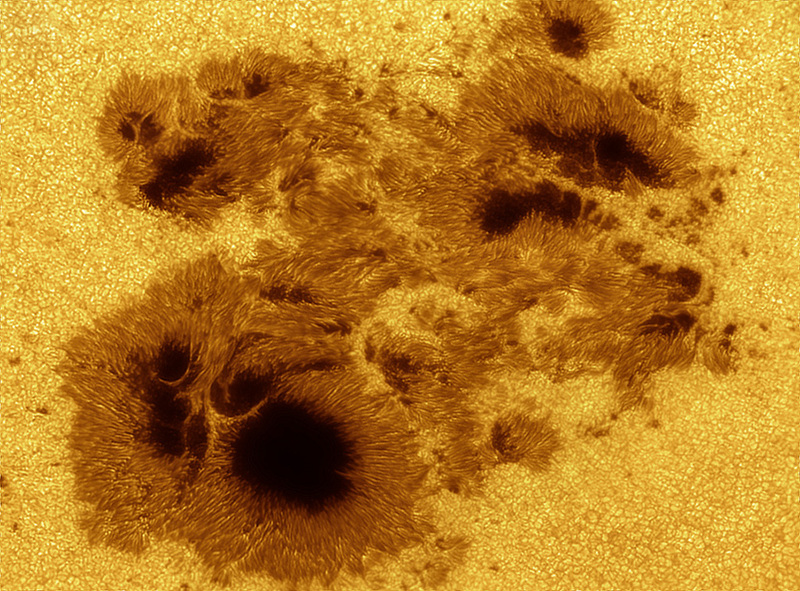 Like other smaller sunspot groups, AR 2192 is now crossing the Earth-facing side of the Sun and appears dark in visible light because it is cooler than the surrounding surface. Still, the energy stored in the region's twisted magnetic fields is enormous and has already generated powerful explosions, including two X-class solar flares this week. Coronal mass ejections (CMEs) associated with the flares have not affected planet Earth, so far. The forecast for further activity from AR 2192 is still significant though, as it swings across the center of the solar disk and Earth-directed CMEs become possible.